Tapan Mukherjee & Consultants, a consulting firm in the hospitality vertical and its ancillaries was founded in 2007 with a vision to undertake technical and management consulting roles along with mentoring aspects. The firm assists in setting up new ventures and also helps existing businesses overcome hurdles. Assignments that TMC has undertaken to ensure that its clients are atop their businesses are concept development, menu planning, cost reduction, facility planning, designing, training, mock runs, trials, standardisation of menu, audits, vendor sourcing and inventory churn among others. Tapan Mukherjee & Co. is a simmering pot of young talented professionals. Most of the competencies like architecture, facility planning, designing uniforms / collaterals, operational experts, process improvers are in-house. This translates into huge cost and time convenience for the company’s clients. Tapan Mukherjee and Co. believes every project is unique and so the solutions here are tailored to meet specific requirements of different clients. The company’s erstwhile clients are currently leaders in their category and cover a cross section of hospitality verticals. From QSR Chains and Five Star Hotel Chains, to Equipment Manufacturers and Malls, Tapan Mukherjee and Co. is considered a game changer not just in the hospitality sector but also in other allied industries. “Our solutions are pivoted on sustainable growth, fostering relationships and thrust in quality”, says Founding Director Chef Tapan Kumar Mukherjee. 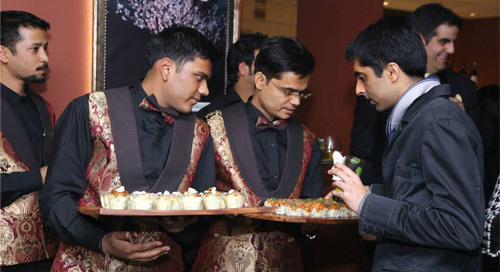 He has extensively worked with The Grand Hyatt, The Oberoi, and The Claridges hotels in India. He also has a rich international exposure. He worked in United Kingdom where he held rossets on his name. Trained at “Vendome” a three Michelin star restaurant in Germany, he is an alumnus of the internationally renowned Robert Gordon University (U.K) and American Hotel and Motel Association. Tapan appears frequently on talk shows and is a routine judge for International culinary competitions. He regularly writes articles for hospitality trade magazines and is a prominent sub-committee member of the Indian Culinary Forum. Consultancy Services from Restaurant Design, Kitchen Set Up to Menu Creation!